Si, dans le film, les kaiju sont vaincus en détruisant leurs cerveaux, cette suite se désintègre en détruisant son âme. Avec son scénario formaté et verbomoteur, assorti de lourds messages moralisateurs, ses personnages interchangeables et sa mise en scène tapageuse, Pacific Rim - Uprising se révèle plus proche de l'univers des Transformers que de celui de Del Toro. En fait, l'insipidité du scénario mince comme une feuille de papier malgré sept scripteurs (!!!) n'a d'égale que le ridicule consommé des dialogues. I'm writing this review in a hurry because every hour I wait makes it harder to remember Pacific Rim Uprising. The unspoken something between John Boyega and Scott Eastwood is way more interesting than the Jaeger vs. Kaiju clashes. 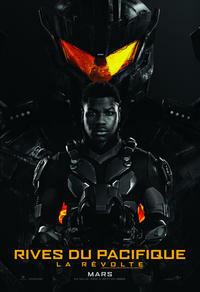 John Boyega leads a group of young robot-pilot heroes into battle against towering monsters in Steven S. DeKnight?s cartoony sci-fi sequel. Pacific Rim Uprising delivers everything it promises on the poster, an over the top spectacle of robots vs monsters that is as exciting a ride in March as anything ever released during the summer movie season. Sequel to the cult kaiju-vs.-jaeger sci-fi movie is just south of soul-killing. But when they?re locked in drift mode, battling giant monsters like some kind of VR interpretive pairs skate, it?s pretty undeniably thrilling. It?s really too bad that PACIFIC RIM UPRISING turned out to be such a poor sequel, as, again, I adored the original. It's disappointing to see Boyega, so impressive in Detroit, not taking advantage of his recently acquired star power to look for more challenging material.